Terezín is 60km north of Prague, approximately in the direction of Dresden. The Ohře River flows between the two parts of Terezín (the small and large fortresses) and continues on to join the Labe at Litoměřice, 4km away. When searching the online timetables, look for Terezín (LT), not Terezín (HO). From Prague, 10 buses each morning make the trip in a little under an hour. Most buses leave from the main bus station Florenc, and at the time of writing they were departing from stands 16 and 17. Further buses depart from stand 7 of the bus station beside Prague’s Holešovice train station, in the suburb north across the Vltava river from the old town. In Terezín, the buses from Prague sweep along a bend past a bastion of the small fortress and then stop beside a huge carpark. This is the place to get off if you plan to begin your sightseeing at the small fortress and prison museum. 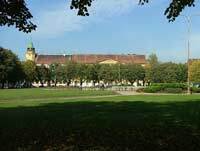 If you plan to begin at the large fortress and ghetto museum, stay on the bus another couple of minutes until it arrives at the tree-lined main square and drops you off in front of the tourist information office, which is just around the corner from the ghetto museum. Getting back to Prague at the end of the day is a reverse of what you did in the morning. Buses run a couple of times every hour until about 5pm, when they become less frequent and stop altogether sometime between 7 and 8pm. You can catch the bus either on the main central square of the large fortress or at the huge carpark near the small fortress. Nearby Litoměřice If you still have some time to spare, you could travel 5 minutes by bus into Litoměřice which is a nice town to have a look around for a few hours or even to stay the night. The late afternoon buses from Litoměřice to Prague are the same ones that pick up at Terezín. If you miss the last direct bus, you should still be able to get back to Prague from Litoměřice by train, with one change. Outside Prague last updated June 13th, 2010. All text and images Copyright 2007-2010. Articles may be excerpted for review, or printed for use by individual travellers. Complete articles or images may not otherwise be reproduced by print, electronic or other means.